Stocks tend to sometimes top and bottom in a sudden manner. When this happens we call it the "V" top or bottom. A stock can rise rapidly for a few months only to crash all of a sudden without any warning. On the other hand, a stock can crash lower so fast in 2 weeks only to quickly recover the drop in half the time. We call that a "V" bottom. These kind of V pattern can be very profitable for traders who learn how to spot them. It is very easy to spot a V top or V bottom. Usually a stock will rise or fall rapidly and then fall or rise back just as fast. The areas where the V top or V bottom reverses are usually long term areas of support or resistance. V bottoms can be the scariest ride for a lot of investors and traders. The stock gradually drops over time and all of a sudden within a short period of time the stock crashes. The crash looks non stop until all of a sudden the stock snaps back up and regain the losses that it sustained during the V crash. Although this is scary, the V move is actually what many traders are looking for. When they see a stock experiencing a V drop, they will seek and find if the drop will rest at long term support. Then they will buy the stock in the hopes of a quick gain. 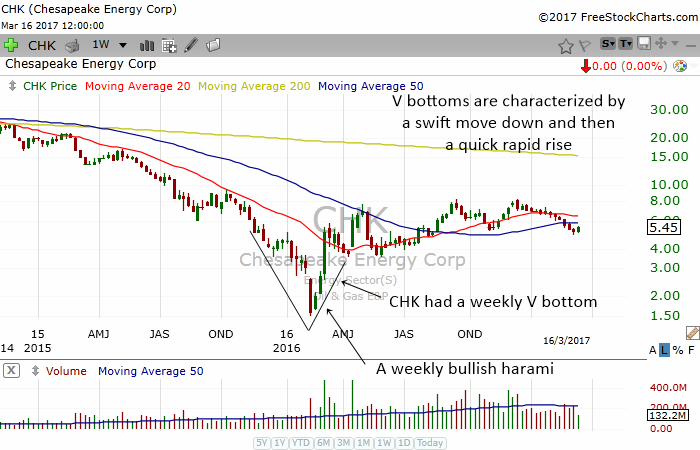 In the chart above you can see how CHK had a downtrend in the weekly charts. Towards 2016, the stock had a quick crash and then just as fast it recovered the drop to form a V bottom. A weekly bullish harami formed and marked the bottom of the V shape. 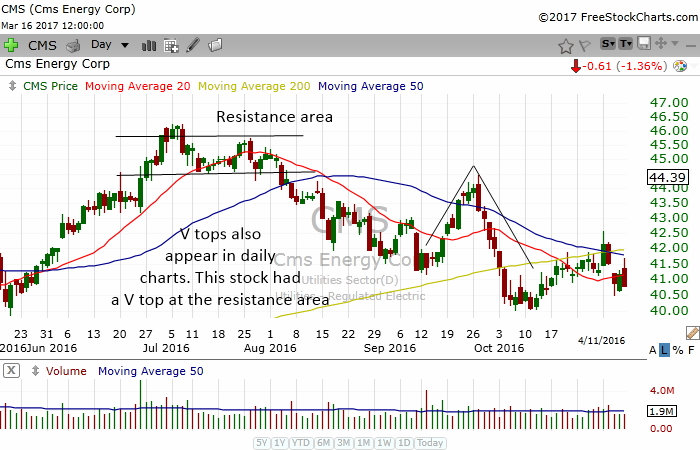 Sometimes it is important for us to find bullish candlestick patterns in a stock to determine whether they might be bottoming or not. 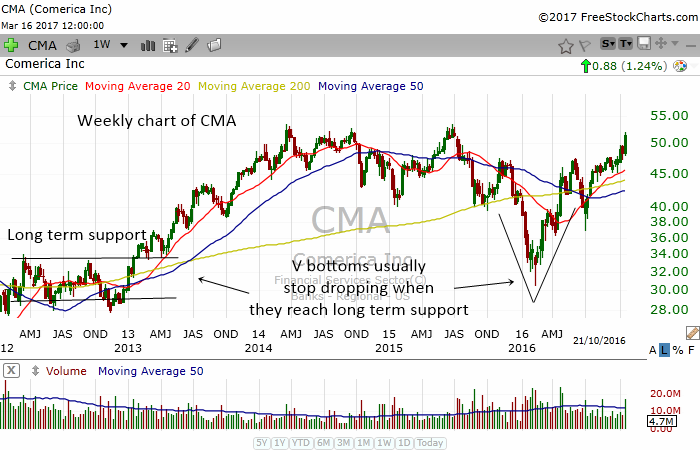 The chart of CMA above is a very good example of how a stock that forms a V shape bottom can be very beneficial for smart traders. The stock was dropping rapidly to an area of long term support. Smart traders saw that and could have bought the stock for a quick V shape rise. That is why when we see a stock crashing rapidly, we must stay cool and look if there is long term support in the weekly or monthly charts. Who knows, it might be a great opportunity to buy the stock at a cheaper price. This is not catching a falling knife but a very prudent and realistic way to trade based on educated analysis of the stock charts. 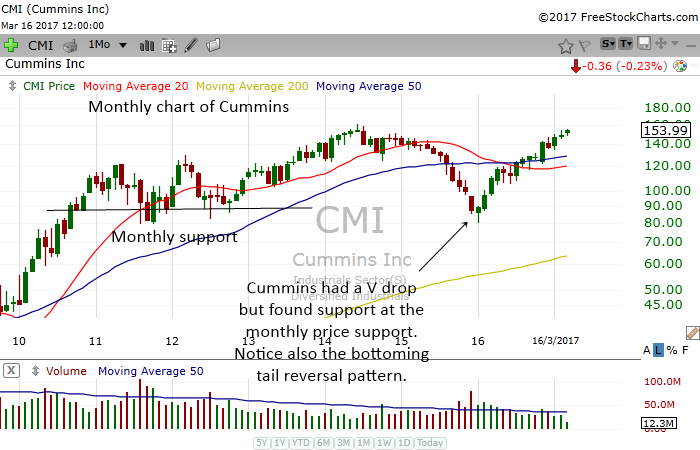 Cummins which I show in the chart above is a great example of a V shape bottom in the monthly charts. The stock was dropping rapidly over the months. Then it formed a bottoming tail which is at the long term monthly support. The bottoming tail marked the bottom and the stock almost magically rise from there. The bottoming tail and long term support made it happen. V tops are the exact of V bottoms. The stock rises rapidly only to decline back to the original price before the stock take off. 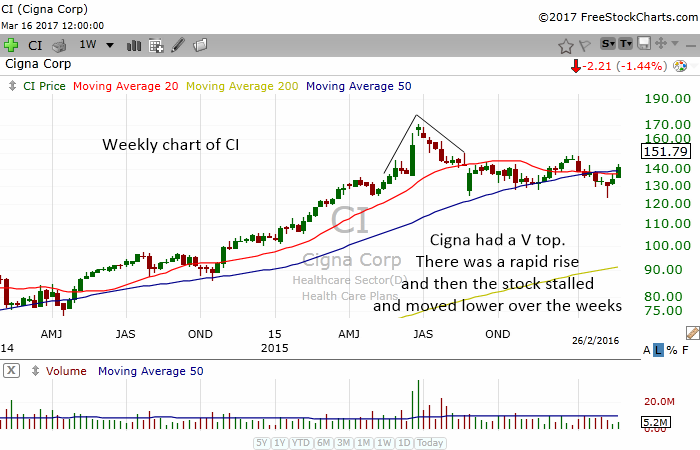 The chart above shows the weekly chart of CI. The stock had a rapid run up and then stalled. The stock then moved lower over the weeks to form a V top. V tops can be very frustrating to investors because when the stock broke out, the investor makes a lot of money. Then when the stock falls rapidly, the investor losses his profits and maybe even more. V tops also appear in daily charts. In fact V tops appear in every time frame. The chart above show the daily chart of CMS. The stock had a fast rally in mid September but it hit the resistance area and wasn't able to rise higher. The stock was also at the 50 MA resistance. Then the stock quickly gave up the gains it had and then more. The lesson is this, the next time you see a stock have a quick rally to a resistance area, learn to take profits. You might be meeting the next V top in your stock. V tops can appear twice in a very short time to form a double top. 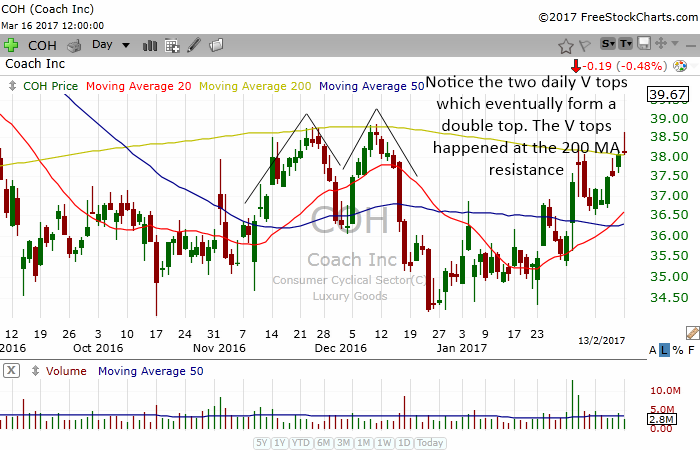 In the chart above, you can see COH forming two V shape tops in just a matter of a few weeks. The V tops happened at the 200 MA resistance which eventually made a double top. Traders who spotted these patterns could have played some nice swing trades. V shape tops and bottoms appear in all stock, commodities, indexes and etfs. They also appear in every time frame imaginable. When you see them, do not panic. Learn to spot support and resistance when a V shape top or bottom form. Then you might turn it into a great investing or trading opportunity which can reap fast huge profits for you.